In our quest to hear that elusive live-performance sound in the comfort of our own homes, we hi-fi enthusiasts can sometimes get caught up in the lust for cost-no-object audio equipment at stratospheric prices. The list of audio components that I dream to own one day -- everything from a pair of B&W Signature Diamond loudspeakers to a Krell FBI integrated amplifier -- now has a total retail cost of over $200,000. But when my inner realist surfaces, I remember that Im a long way away from being able to afford such exotic gear -- and find myself lusting for that live-performance sound at a price I can afford. Peachtree Audios Nova ($1199 USD) looked as if it might get me part of the way there. Peachtree Audio is owned by Signal Path International, a company based in Bellevue, Washington, and best known for producing the Decco integrated amplifier and Era computer speakers. Their Nova is an integrated amplifier that also houses a highly sophisticated digital-to-analog converter. At first glance, the Nova looks sleek, in a rounded real-wood case that comes in cherry, rosewood, or the piano black of my review sample. It measures 14.75"W x 5"H x 14"D and weighs 26 pounds. The Novas MOSFET amplifier puts out a claimed 80Wpc and is fed by a hybrid sold-state/tube preamp section. Peachtree includes the tube -- a Russian-made Electro-Harmonix 6922EH -- because they believe that a tube in the signal path can smooth out the harshness of digital signals while still retrieving a high level of detail. Theyve even gone so far as to allow the user to switch between solid-state and tube preamp modes -- a nice touch that allows you to choose how to feed the internal amplifier, preamp output sockets, and even the class-A headphone amp, and thus tailor the sound to your taste, making pairing the Nova with different types of equipment much easier. All of the Novas functions can be accessed via a high-quality, rubber-like remote control. The star of the Nova is its DAC. This advanced piece of equipment uses the ESS 9006 Sabre DAC chip, "organic" capacitors, 11 regulated power supplies, transformer-coupled digital inputs to avoid grounding problems, and a USB input galvanically isolated to help keep PC noise from reaching the DAC. According to a Peachtree webpage, "The ESS Sabre DACs patented jitter reduction circuit re-clocks the digital signal to almost 0 jitter before passing it through a high-resolution 24/96 upsampling processor thats also capable of 122dB s/n ratio." The Nova has a large assortment of input connections: three analog (one for home-theater bypass), two coax, two optical, and one USB. All of the digital inputs accept 24/96 signals except the USB, which accepts only 16/44.1 and 16/48 signals. Theres also a line-out that lets the DAC section be used alone, as well as a Pre-Out jack to hook up an external amplifier or subwoofer. A nice touch that were starting to see on more audio products is the ability to choose among digital filters. On the rear of the Nova is a button that selects between Sharp Slope and Soft Slope filters. A sharp filter usually measures better, but a soft filter usually sounds better. Indeed, I found that the Novas Soft Slope filter did sound better, and thats what I used throughout my listening. One unique feature of the Nova is the ability to install in it a Sonos ZP-90 ZonePlayer. A plate on the rear panel can be unscrewed and the ZP-90 installed. Then, all the user need do is hook up the ZP-90 to the Nova via its digital outputs (coax or optical). This turns the Nova into a wireless high-resolution integrated amplifier. I am aware of no other product on the market that lets you do this. My reference system for this review consisted of an Oppo BDP-83 Blu-ray/SACD/DVD-A/V/CD player hooked up to the Nova via Monster M1000 unbalanced interconnects. I used my HP Pavilion notebook computer to stream digital files from a 500GB Western Digital external hard drive via Kimber USB cords. The Nova was connected to my Paradigm Reference Studio 10 v.5 monitor loudspeakers via Monster MCX-2s cables. AC was run through a Lindy power conditioner. When I listened to the Peachtree Nova right out of the box, I was immediately struck by its clean sound. Backgrounds were noticeably quiet, and soundstages were very open and clear. The Novas sonic signature appeared to be very neutral, even with the tube stage engaged. However, I like to give any new audio product a solid break-in of 100 hours or more before I draw any conclusions. That done, I sat down to do some serious listening. I began by feeding the Nova a traditional analog signal from my Oppo universal player with the Novas tube disengaged. What caught my attention again was its neutral character. Voices were presented very clearly, with good tonal balance. The Nova was very transparent and served up a lot of detail, but not in any way that made it sound clinical or aggressive. It had a slightly warm character -- that is, it was a little laid-back. For the detail-oriented listener, however, it still served up plenty of microlevel nuances that never seemed veiled from its overall sonic character. All of these attributes caught my attention when I listened to "Temptation," from Diana Kralls The Girl in the Other Room (CD, Verve 000182612). At the beginning of this track I could vividly hear the strings of a double bass being plucked with a great sense of resolution. Notes decayed as they would in a live performance. Kralls voice chimed in with realism, surrounded by a sense of "air" -- not thrown in my face, but presented on a beautifully rendered soundstage. Each instrument of the band was in its own space -- I could close my eyes and easily pick out each instrument. One of my pet peeves tends to be soundstaging -- if a component doesnt do this well, the music just doesnt sound real to me. The Nova soundstaged very well. Listening to Krall shed light on how balanced the Novas sound was: The midrange was smooth and expressive, instruments had balanced timbres, and the Novas retrieval of detail was first-rate. When I put on music that doesnt need to be played excessively loud, I was rewarded with a first-class midrange. I stayed at moderate levels because it became clear to me early on that the Nova cant be considered a "dynamic" integrated amp. It could definitely play music quite loud, but this wasnt its sweet spot. The Nova didnt have the power and muscle to handle the higher decibel levels, especially with rock music. Thats not to say that the Nova lacked authority. It had good attack when the music picked up the pace, and it got my toe tapping many times during my review. Beyond that, the Nova had good control over the bass and created a tight, tuneful sound. When I played the Doors "Riders on the Storm," from The Very Best of the Doors (CD, Rhino/WEA 277180), the bass line that drives this song was delivered with force and composure. It didnt have that powerful slam associated with higher-power integrated amplifiers; instead, it focused on tighter bass, with a sense of warmth that never sounded bloated. Another great example of this is U2s "Sunday Bloody Sunday," from War (CD, Island 001083202). Through the Nova, the bass was tight and focused, and helped bring this song to life. The Nova also brought Bonos tenor to life in startling fashion. It put a grin on my face to hear his voice rendered in such a way through this integrated. Bonos upper register sounded delicate and sweet, re-created with a great sense of realism. Thus far, everything Ive said about the Nova has described its sound with its tube disengaged. Switching the tube in-circuit gave the sound more body and depth while making it more laid-back, smoothing out the digital sound and adding a bit more warmth. Detail wasnt lost, however; it was still there, just a touch smoother. The soundstage was slightly bigger, and voices seemed to take a step forward and grow in height, giving me the sense that the stage was more three-dimensional. When I listened at loud levels, the tube really helped cut down on listening fatigue, but since the tube is in the preamp stage and the power-amp stage is still operating in solid-state, the bass was still tight, with the same impact as before. An interesting characteristic that I noticed was that when the tube was engaged, some tracks sounded better while others did not. For example, jazz, classical, acoustic, and vocal-oriented music sounded much better through the tube. On the other hand, if I played something with a faster rock beat, the Nova sounded better with its tube disengaged. This will be a matter of taste. Luckily, you can switch the tube in and out from the comfort of your seat, via the remote control. USB DACs are now a dime a dozen, but many of them are carelessly integrated into their host components. They offer the connectivity that consumers want, but in terms of sound quality they dont hold up against traditional S/PDIF. But fed music via its USB input, the Nova sounded simply wonderful, producing a deep, black background from which the music emerged. I listened again to all the music Id played through my Oppo BDP-83, this time feeding the Nova WAV files from my computers hard drive via a Kimber USB cable. The sound was equal to that from the Oppos analog output. I could hear only slight sonic differences, which I chalk up to the fact that the Oppo uses a Cirrus CS4398 DAC for its stereo outputs. There was still air around the instruments, as with the Oppo, as well as good decay of notes, balanced tonality, and soundstages just as wide as before. I then compared the sounds of the Novas USB and S/PDIF inputs. Shockingly, I heard no difference whatsoever. Its obvious that a great deal of research and hard work have gone into the development of the Novas DAC section. I had on hand a Cambridge Audio 840A V.2 integrated amplifier. The 840As very powerful, detailed sound leans more toward the cooler side of the tonal spectrum, though without sounding clinical. Like the Nova, however, the Cambridge throws a wide soundstage, has good decay of notes, and good bass. The Cambridge 840A V.2 had the advantage in the power category. Its massive toroidal transformer gives it stronger bass, and when you push it to high volumes, it can keep up due to its huge power reserves. The Nova has a good-sized toroid, but isnt as powerful. This isnt to say that I couldnt crank up the Nova -- it had no problem driving my Paradigm Studio 10s to uncomfortable levels. You just have to be realistic. The Nova pushes 80Wpc into 6 ohms, and the 840A delivers 120Wpc into 8 ohms. The 840A has more muscle to drive difficult loads, and I could hear the difference. David Solomon of Signal Path International pointed out that the Nova will be stable down to 4 ohms, as long as the speakers impedance doesnt drop below that. If your speakers tend to drop below 4 ohms, he recommends you use an external power amplifier. Both the Nova and 840A had very low noise floors. They sounded similar when the Nova was in pure solid-state mode, but when I switched in the Novas tube, music sounded more natural and lifelike. I was pleasantly surprised by the Peachtree Audio Nova -- its a great audio component. However, its not a giant-killer in all areas. Pushed to high decibel levels, the Nova could lose its composure, the soundstage tending to blend together a bit -- not horribly, but images did mesh together. Rock lovers who like to crank up the volume to 11 should look elsewhere, or invest in a hefty external power amp. I found myself playing with the Novas tube option a lot -- it could get a little old turning it off and on, depending on the recording. Two quibbles: the volume knob on the front panel felt a little loose for my tastes, and the binding posts could be of higher quality. Other than that, I was impressed. The Nova has enough connectivity to handle a wide variety of digital and analog sources. It will work great as a traditional analog integrated amplifier, but with such a glorious DAC section, it would be a crime not to take advantage of its processing power, with which any computer-based music server can be turned into a hi-fi source. You can even use a Sony PlayStation 3s optical output and transform the PS3s sound into real hi-fi. The possibilities are almost endless. 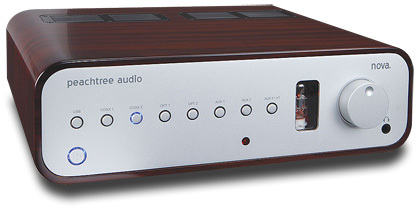 The Peachtree Audio Nova retails for $1199; from what Ive heard, its sound puts it at the top of that price category. Even if you took away its USB DAC section, the Nova would still be a relative bargain -- but having that DAC section included at this price is just phenomenal. The Peachtrees sound wont threaten products costing three or four times as much, but the Nova is a transparent and composed integrated amplifier with an overall musicality that anything at or anywhere near its price will find hard to beat. In a world in which you can spend a great deal and not get much, the affordable Nova is a nice surprise. Warranty: One year parts and labor; six months on tube.